Chocolate lovers, fruit lovers, and lovers of chocolate and fruit together take note. This is the first time we’ve had these famous figs in white chocolate and I’m going to call it now: this is a big deal. We’ve been selling the dark chocolate version of these figs for more than a decade and they haven’t changed the basic elements of this new confection. 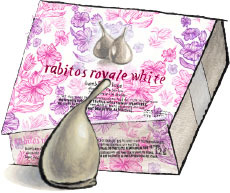 Dried figs are filled with soft white chocolate truffle cream and a hint of liqueur and then dipped in white chocolate. They're light and sweet and have a faint strawberry-twinged aroma. As the saying goes: if it ain’t broke, cover it in white chocolate.